Common Mushroom (Agaricus bisporus). There are a few other common names the Common Mushroom has: Button mushroom, Portobello, Portabella, Portabello, White mushroom, Table mushroom, Cultivated mushroom, Champignon mushroom, Cremini/Crimini mushroom, Brown cap mushrooms, Italian mushroom, Italian brown, Roman brown mushroom, Swiss brown mushroom, chestnut mushroom, Portabellini, Baby Portobello, Baby Bella and Mini Bella. It also has two other Latin names: the Agaricus brunnescens, and for the white version only, the Agaricus hortensis. Now, I know a lot of people will wonder how the "Button mushroom" you buy in a store could be the exact same mushroom as the Portobello. For one thing, the Button mushroom is picked at a very immature stage of the mushroom's cycle - known as the button stage, hence the name "Button mushroom". 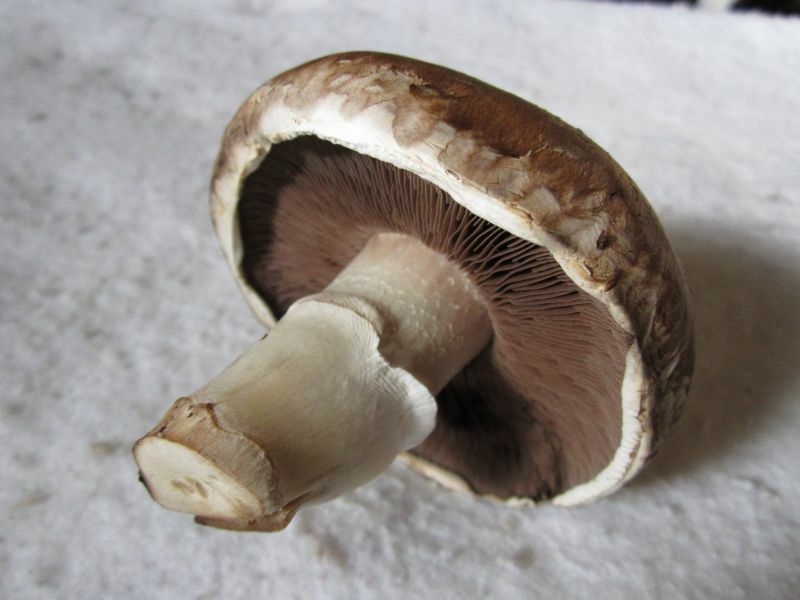 The Portobello is picked when the mushroom is at the fully mature stage. The color difference on the cap (white or brown) is just due to variations within the species. In the wild, you are far, far more likely to find the brown cap variety. The white ones you buy in a store all came from a source of white ones found by accident many decades ago. This mushroom is a good place to start. You get results fast with kits, the fruitings come up many times, and most people know what they look like and how to use them. Read up on how to grow these mushrooms if you want to try it outside. How to grow Agaricus bisporus here (Google search) and here (Bing search). Cap Morphology: Depends on stage. Flattened spherical when a button, to convex when mature, to flat when very mature. Can be white or light brown, light brown is the most common. Generally ranges from 3-16 cm (1 1/5 to 6 1/3 inches) across. Flesh on cap is thick and white. 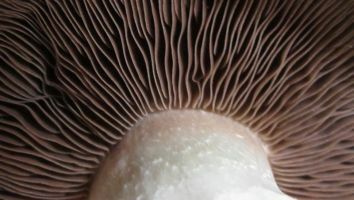 Spore Bearing Surface: Gills on the underside of the cap. Pink to pale brown when mushroom is immature, turning to brown when mature to very dark brown when very mature. Gill Attachment (how the Spore Bearing Surface is attached to the Stipe or Stem): Free - not attached to stem when mushroom mature. Stipe (Stalk): Has an annulus (ring). Stem is 2-8 cm (4/5 to 3 inches) long and 1-3 cm (2/5 to 1 1/5 inches) thick. Partial Veil: Yes, button size mushrooms have veil present (therefore you cannot see gills). Once the mushroom is mature, veil is gone. Season: Late spring to fall. Habitat: A few to a huge number on compost or manure. Most commonly found in the grocery store, but in the wild best to look in grassy areas where animals are grazing and leaving their manure. Notes: This is the most commonly grown mushroom in the world. Agaricus bisporus. Cap is convex to flat. The gills are free (don't touch the stem). Often there is a ring on the stem a little down the stem under the gills, and you can see it clearly here.